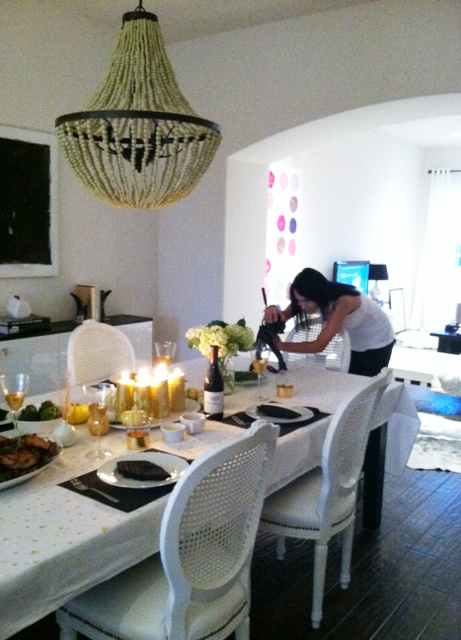 We had such a great Holiday weekend and 3 of us helped decorate while my guy did all the cooking...yes, ALL. He is such a great cook & wanted to do it all himself. I'm so thankful for him. 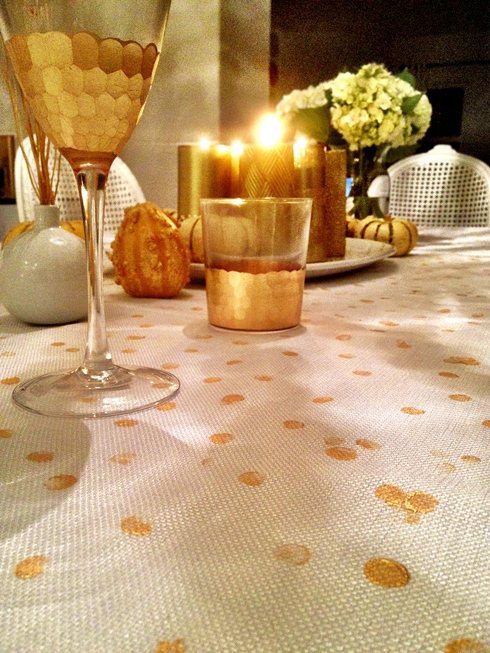 I decided to incorporate some GOLD into this Holiday....and I knew the tablecloth we bought was way too stark white. So, we PAINTED gold dots all over it & it made the table look so much more interesting...what do you think? Notice the Gold chisel glassware from ZGallerie?? They're amazing! I am all kinds of in love with your glassware. Such a pretty table! those are gorgeous wine glasses! Where did you get them? the hanlon's - got them at zgallerie! That spread looks delicious! You're a lucky lady! I LOVE those glasses, I think I'm going to stop by Zg soon! you house is absolutely amazing! i do hope you know. and i really really do hope you paint another polka dot painting. a big one. because i will 100% buy it. PROMISE! I LOVE the stemware! I have been obsessed with those pretty little guys for quite some time! I also really love the addition of the polka-dots, so cute. Looks like you guys had a super delish Thanksgiving, you snagged quite a guy! Have a great day Jen! Just fabulous! Aren't hydrangeas the perfect centerpiece flowers? 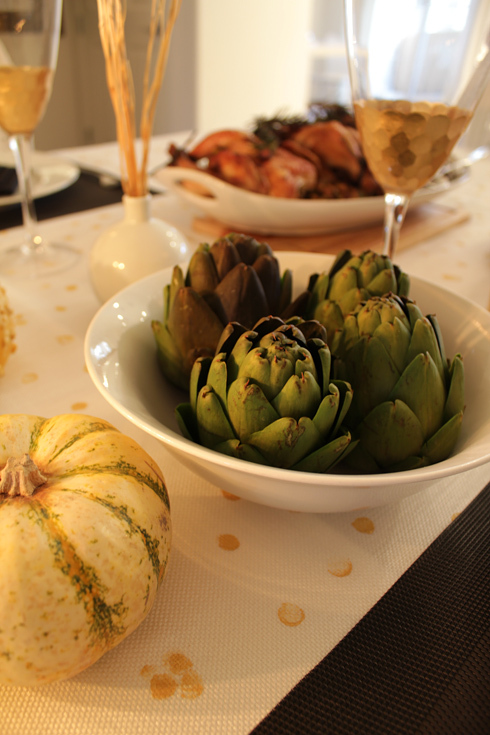 I used them on our Thanksgiving tablescape as well! K clearly your guy is a great cook...i just got hungry looking at that! love the gold dots, very elegant and fun. what a gorgeous tablescape! love your glasses. Gorgeous! I love the gold dots you painted on the table cloth- they look so perfect with your beautiful glasses. All the food looks delicious too. So Pretty!! 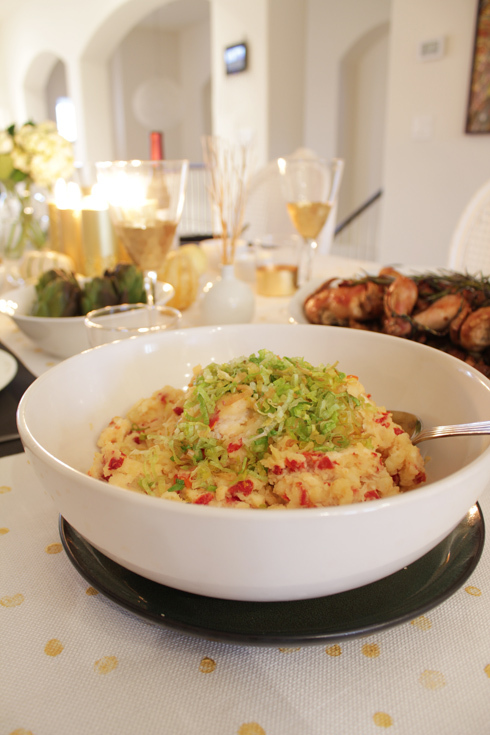 Love the gold dotted table cloth Jen and the food looks delicious! EDYTA: thats so sweet ....thank you! I love your profile pic on your blog, looks so pretty! I love the glassware, and your hubby is just too sweet to cook for everyone, give him a big hug for me! Pretty table - simple but elegant. Great idea to paint the tablecoth too. Those glasses are all kinds of gorgeous! ABODE LOVE: Thanks! - he's so awesome to cook for all of us...and he didnt want any help!! EMILY : hmm....id have to ask my guy, but the one i remember is the sun dried tomato mashed potatoes. - They're delicious! the food and table decor look fantastic! Looks like your hubby is a great cook and the presentation is amazing! 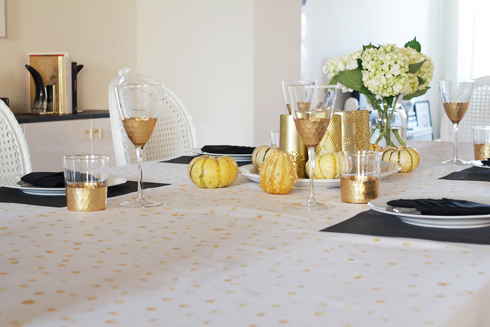 Love how you did with the table cloth, your dining table looks more glam. 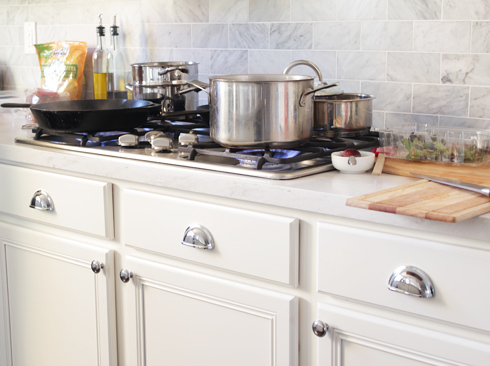 I'm in love with the shot of your kitchen so with the cooking and preparation..maybe because I love to cook! :) Glad you have a great weekend.God bless! Love all the gold! 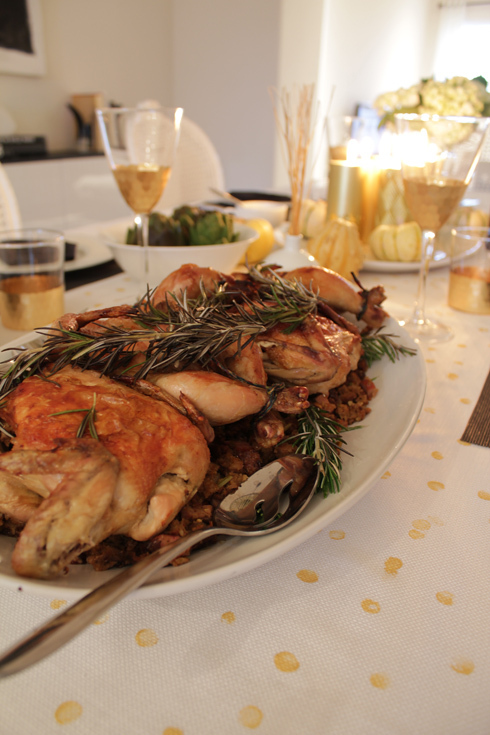 ..and all the food looks delish! Can I send my husband to hang with yours for a few days lol. I wish he knew how to cook. Lovely pictures. and i adore those gold wine glasses!!! matches the whole table setting! decor fantastic. You and your hubby make a great team! ahh gorgeous! looks amazing jen. Love the glassware. Beautiful. I love the polka dots and I love your glassware. I am loving the glassware myself. Think it may be on my Xmas list! And I love the gold dots -- did you use a pencil eraser? COURTNEYOUTLOUD: thx! No, I actually used the bottom of a wooden handled sponge brush. It was perfectly flat so it worked out well. I'm eating lunch as I read this and I'm STILL salivating! What a great guy you have. And you, my dear, put together a gorgeous table. Love that cloth! That dinner looks incredible! 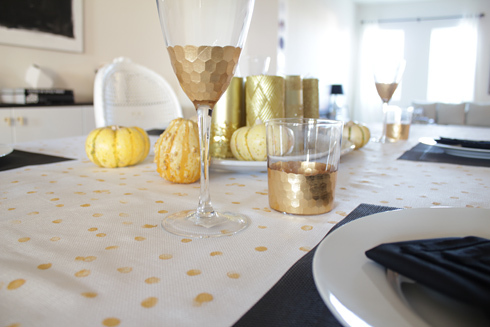 And your table cloth looks amazing with those gold dots. 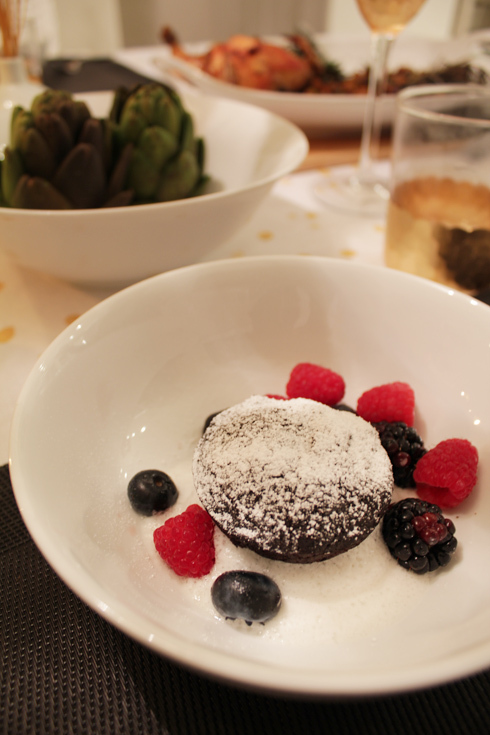 ps: that desert made me hungry! How yummy! Looks so delish.. and beautiful! Great job! Yummy! 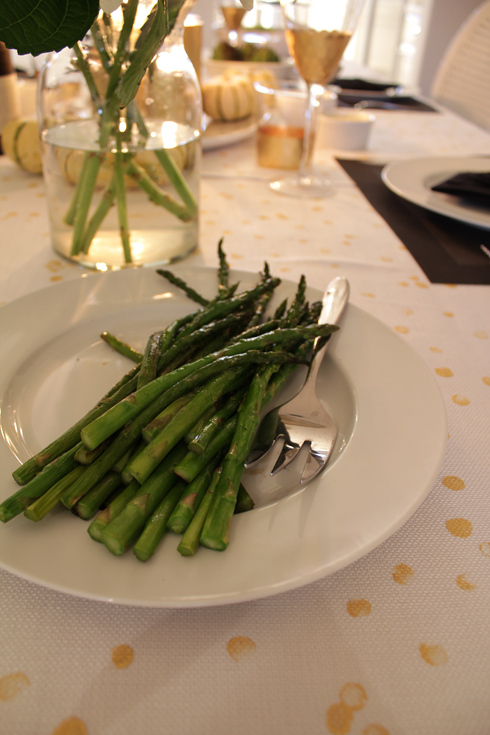 How about asking you hubby to do a guest post with the recipes he used? Food looks great! Just gorgeous Jen. Food looked amazing, great photos of a special day! 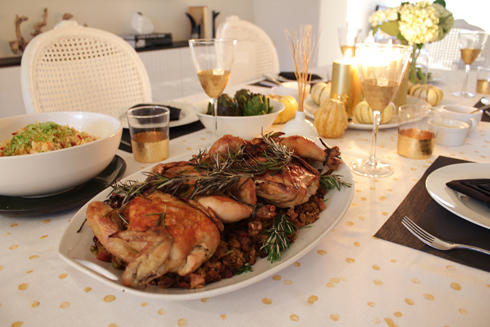 I LOVE this Thanksgiving setup!! and I LOVE that you painted the table cloth with gold dots!! So cute and great touch!! oooh! beautiful! cant express how much i would have loved to sit here! Wow love your table setting. Everything looks great! And the food looks delic. So chic, love it Jen!! The dots on the table are soooooooooooo cute! You have talent, lady! Want to Advertise your blog or biz? ?